Israel will promote new construction projects in Jerusalem, including hundreds of new housing units in Ramat Shlomo. Israel will promote new construction projects in Jerusalem, including hundreds of new housing units, the Interior Ministry announced on Tuesday night. A statement released by the Ministry said that Interior Minister Gideon Saar and Prime Minister Binyamin Netanyahu had jointly agreed to promote four different building plans in Jerusalem. According to the statement, 1,500 new housing units will be built in the Jerusalem neighborhood of Ramat Shlomo, a new tourism and archaeology center will be built opposite the City of David archaeological park, and a new national park will be established on the east side of Mount Scopus. In Ramat Shlomo, Saar and Netanyahu have also agreed to promote plans to expand existing housing units in the neighborhood by up to 50 additional meters per apartment. The Ramat Shlomo project, which has dragged on for years, has yet to see one shovel touch the ground. Nevertheless, a routine announcement involving part of the processing set off a diplomatic firestorm during a visit to Israel by U.S. Vice President Joe Biden in March 2010. After receiving basic authorization by then-Interior Minister Eli Yishai in August 2011, the plan was quietly shelved. Last December, it was revived in the wake of the de facto recognition of the Palestinian Authority as a sovereign state by the United Nations General Assembly, which passed a resolution approving its new status as a non-member observer state. The Interior Ministry last year decided to go ahead with plans to build 1,500 new homes in Ramat Shlomo, though it reduced the number of homes to be built, which was originally set to 1,600. In August, the Jerusalem City Council transferred funds for the construction of funding in neighborhoods of Jerusalem liberated during the Six Day War, including for new construction in Ramat Shlomo. Ramat Shlomo is often erroneously described by anti-Israeli media as an "illegal settlement in east Jerusalem". 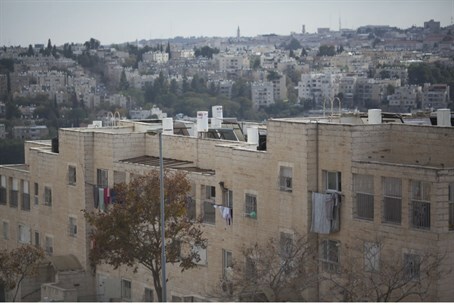 Israel has been slammed in the past for promoting construction in the neighborhood. The timing of Tuesday’s announcement by the Interior Ministry is not coincidental and is likely tied to Israel’s release of 26 terrorists as a “gesture” to the Palestinian Authority. MKs from some of the parties in the coalition have linked the terrorist release to construction approvals for homes in Judea and Samaria. The religious Zionist Bayit Yehudi party rejects this link, saying that Israel has a right to build in Jerusalem, Judea and Samaria whenever it wishes, regardless of whether it releases terrorists.